Some 10,000 spectators from all over Belize crowded this normally sleepy town bordering Mexico to see upstart new comers Corozal Community College dethrone former champions Succotz Festival Band to take title of Overall Winner in the Wind Instrument Category. 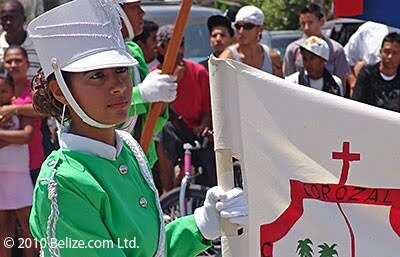 Placing second as Overall Winner was four-time consecutive winner the Succotz Festival marching band, with another band from the same village located in western Belize, the Western Xunan band won third prize. Various other sub-prizes included the Drumline Contest won by south side Belize City based St. Luke Methodist Band, and the Drum Corps Marching Band competition won by another Belize City band Holy Redeemer - the defending champion. Pictured #1: Overall Winner Corozal Community College. From the outset the Corozal Community College outclassed its competitors with beautifully color coordinated uniforms of white and pastel green and excellent music and choreography. The defending and dethroned champions Succotz Festival just did not get it in uniforms which appeared dark and drab and while the music was excellent, the choreography could not compete with the CC C's bold movements on the street parade and the stadium competition. For one day, Corozal Town more resembled its bustling and giant neighbor Chetumal, in neighboring Quintana Roo, Mexico with thousands of visitors pouring into the town from all over the country, leading to traffic jams and the cordoning off of main streets. The participating bands started their parade at Santa Rita Hill on the northern entrance to Corozal, headed to the Miami Beach recreational area, then swung unto the town's commercial centre and park at Forth Avenue before entering the Santiago Ricalde Stadium for judging and award of prizes. Picture #2: Western Xunan - third prize Overall Winner. Among those presenting prizes were the Governor General Sir Colville Young and local politicians. The event is an annual commercial enterprise operated by the country's largest radio station Love-FM. Linda, what can I say, Thanks again for the information we are not getting anywhere else. Thanks for keeping us updated with the happenings in our country. It's so refreshing to see the talent of our young belizeans being recognized.On behalf of my family, we appreciate the work. I gotta agree with Cherry. I live in Belize and I don't get all this info sometimes. Thanks Linda. I gotta also say congrats to all the youths who participated in this event, that sun was HOTT!! !